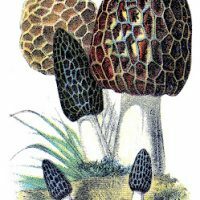 This one comes from an 1870’s Garden book. I have such a thing for Glass Cloches, they look great anywhere you put them! This one has 3 potted plants in and it, and there is a second makeshift one using a Wine Glass. What a great idea! I hope you can use these in your Garden themed projects! Old Fashioned Corset Ad Free Spider Web Image Vintage Farmhouse Ephemera Image – Chickens! Thank you, thank you, thank you for such lovely images. Thanks Karen. Today it is the coldest day of the year so far and this little graphic reminds me that spring will come. Will let you know what I do with these fabulous pieces, I adore flowers!!! Love those garden cloches! I’m a gardener myself so have quite a weakness for these. Thanks for sharing! Sandra, It’s very cold here today too! Windy, snowy and blustery. I’m ready for Spring! This is perfect for todays weather. We are usually draped in snow this time of year, but not the case. Today feels like Spring. Even went out in stocking feet to bring in the garbage can. 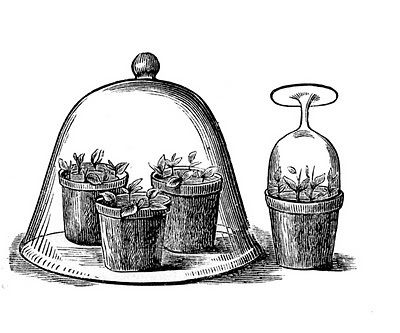 I love cloches and your mini garden underneath is sweet! Thank you, as always, for such lovely things! 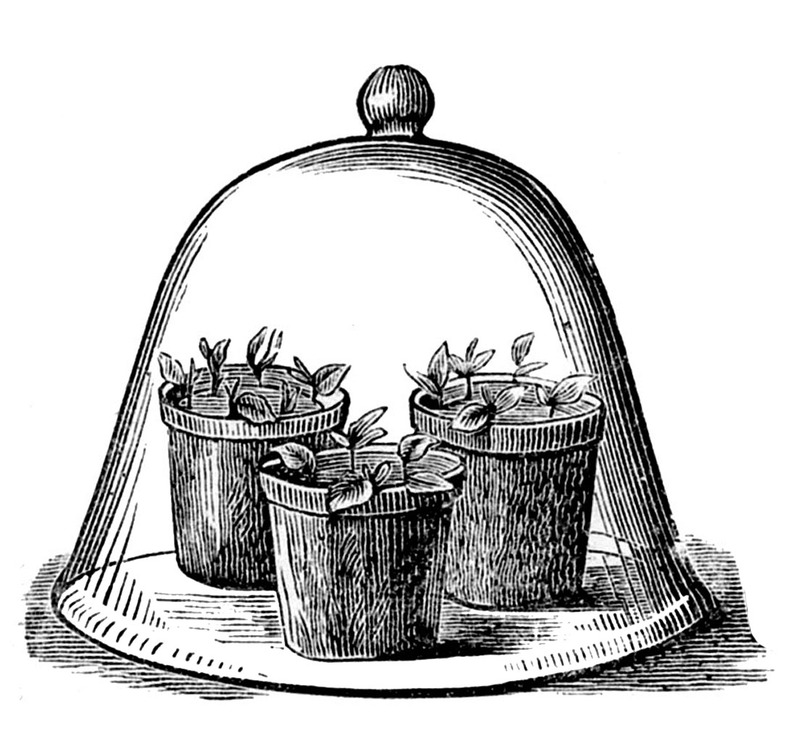 I absolutely love cloches and am wondering if you could post it again, but empty – that is, sans plants. That way I could use it as a transfer around other items that would look heavenly under a bell jar. Thanks again a gajillion times! All I can do is to repeat comment Nr. 1. from scrapunzel: Thank you, thank you, thank you for such lovely images. You really are the best! Greetings from Germany and HAPPY NEW YEAR! Thanks for the mention Karen! 🙂 As always your images are amazing!! thank you graphics fairy for the little boy with dog vintage clip art. I am looking for more of the same type with little boy wiping of chalkboard with a little girl watching…was said to be a victorian valentine. Love the cloches, will make great prints to be framed. THanks so much Karen.